But before I get to that...I had a lot of questions about how I applied the wrapping paper to the wall in my last post...I did it the same way as I did the first time (you can read about it by clicking the link about gift wrapped walls in the post) I used my staple gun. I just stapled the paper around the edges, and a couple of times in the middle. Because the space I was covering was relatively small, it worked like a dream, and it's easy to remove, which is important because this is a rental house. Okey dokey, now on to the cards. I saw this very cute idea floating around blogland last year, and mentally filed it away to use for this year's Valentine's cards. Then I used Picnik.com to add borders and text to each. I poked holes in each card at the top and bottom of each child's fist. And then the five of us had fun putting lollipops on each card by weaving the sticks through the holes. And the best part is, they are completely, 100% personalized. No one else in their classes will have cards exactly like theirs. I love that. 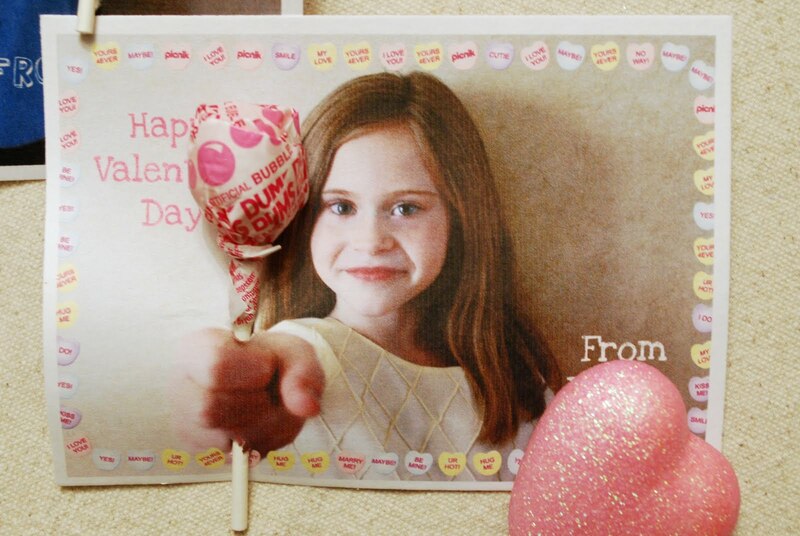 Not only are the Valentine cards adorable but your children are GORGEOUS. I could hug those kids forever. 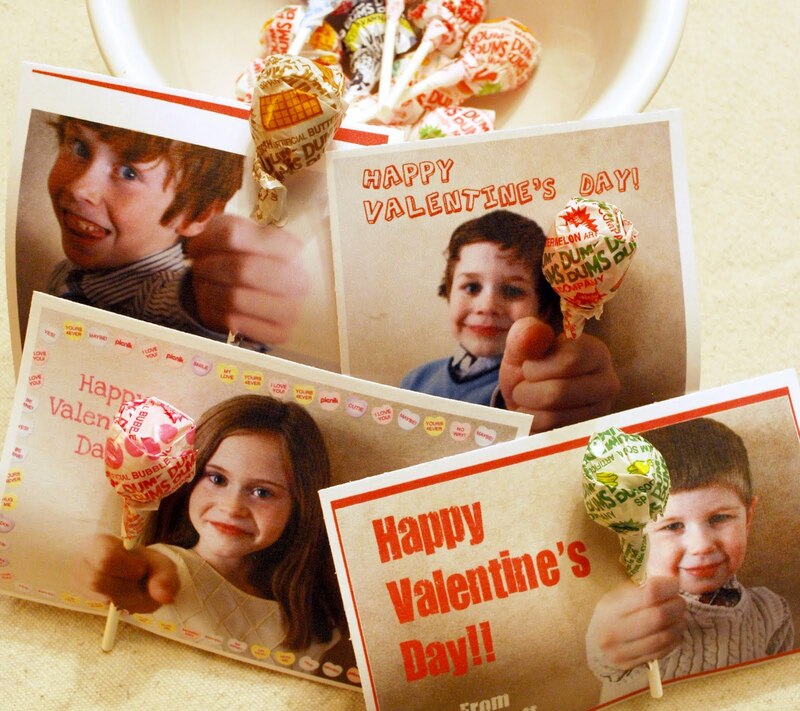 What a cute idea and cute kids too! But wait.....you made a "mental note"??? You can do that??? I try to make mental notes and they stay in my brain for approximately ONE hour. I am even more impressed that you remembered it for a YEAR! You are my idol. This is the best Idea!! and they look so Good!! Thanks for sharing!! 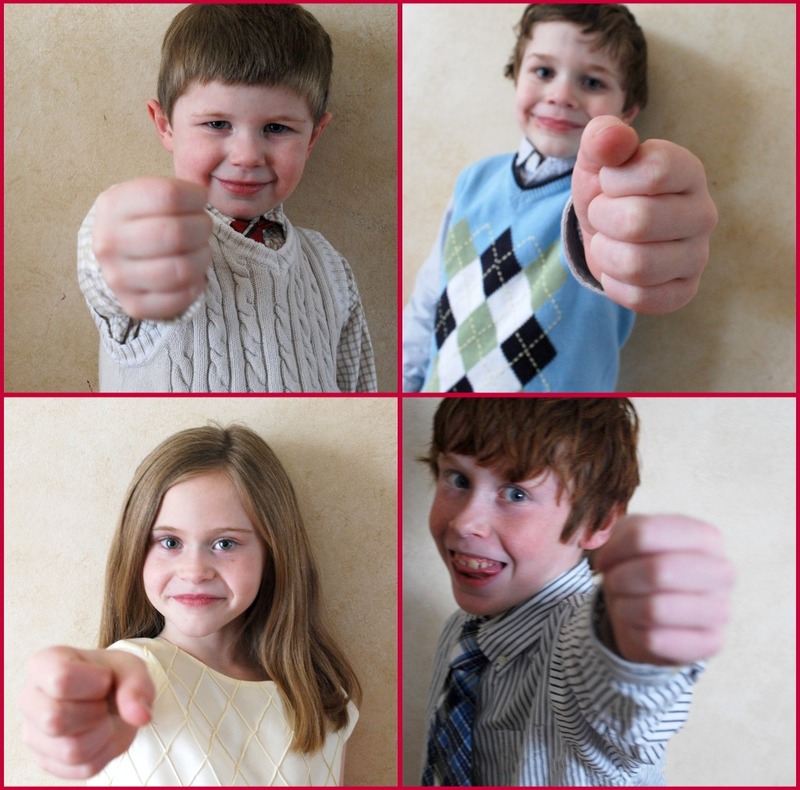 How inspirational ~ great idea and your children are very cute~ LOVE IT! Thanks for sharing such a great idea!! 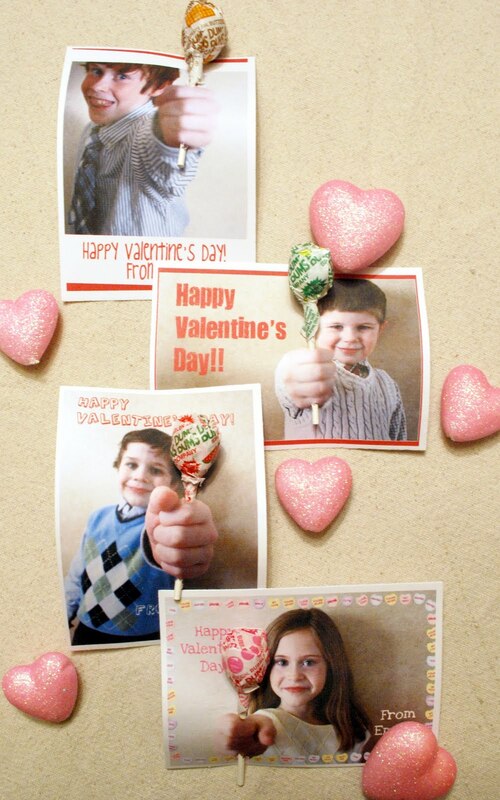 Those Valentines are absolutely precious!! 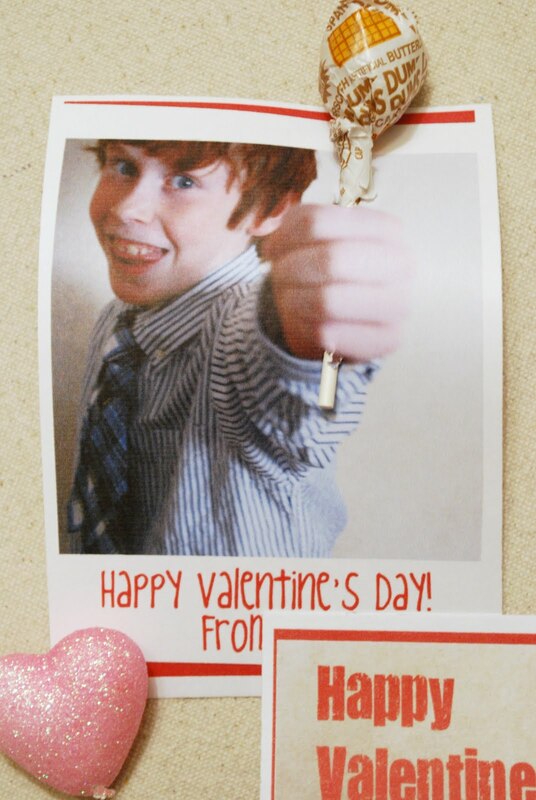 I am so happy that you filed that idea away in your brain for this year's Valentine's day because I'm now going to file it away in my brain for when my oldest (4) starts to have to do those types of things! :-) Awesome! What a simply fabulous idea! I love it! Did you print these out at home? What printer do you have and do you love it? Mine is an ink monster! My favorite Valentine's so far -- personal, easy, and not cartoon-character oriented. Love them!! Thanks for sharing! Oh no way! Those are so dang cute and clever! WOW! Oh My Gosh how adorable are these? I have so been trying to come up with a personalized Valentine for my Grand daughter and I wanted to incorporate her photo. Guess what I am going to do? wow! Thanks for the post!!! I am TOTALLY doing this!!! Thanks!!! LOVE these, Wendy! And your kids are adorable! I am going to try to remember this idea for next year! That really is a great idea!!!! Thank you for this AWESOME idea! Totally running with it. They are adorable! So are your kids! these are absolutely adorable!! what a great idea. Your kiddos are TOO cute! I have always thought this was a great idea. Maybe I'll try it with my kids. We haven't done their Valentine's cards yet. Thank you for posting this! 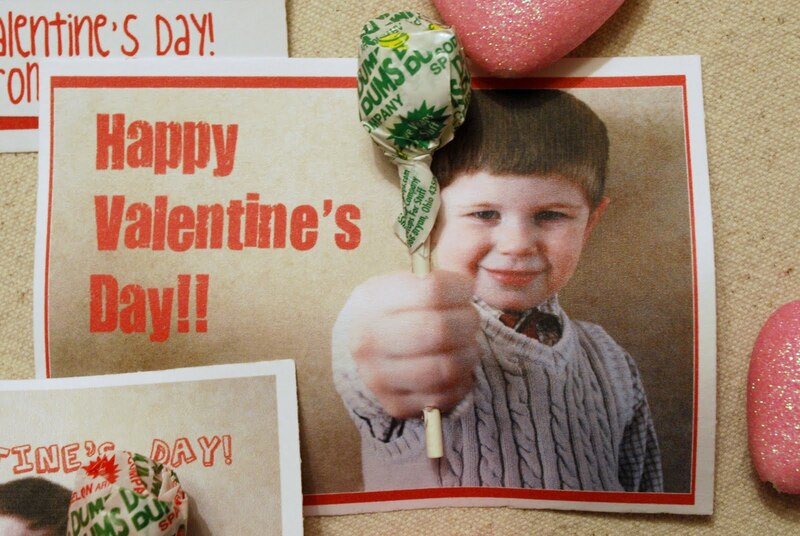 I totally just stole this idea and whipped up a dozen of them for my preschooler for his Valentine's day party tomorrow! Even with printing the photo's at Target & buying an entire bag of Dum-Dum suckers it was *STILL* cheaper than ONE box of the generic "card & candy" things you can get! That is the CUTEST EVER!!! These are insanely cute! And such a great idea!!! We have a FIVE lb bag of organic suckers sitting in the cabinet just waiting for something like this. Our youngest is the only one who has an actual "party" at school but I know at least one of our older boys would like this to give out to his friends as well. I think we are going to add fake mustaches and a corny joke with ours cause he is just that kind of kid. Thanks for the great idea!! Ok. That is absolutely adorable! I am loving it. Would even be cute as a party favor. Your children are precious. Your kids are so lucky to have such a creative mom! I would have loved to have something like these to pass out at school back in the day! did you make me any?? I won't be able to comment anymore because i am getting rid of my google account and you don't take comments from name/website. boo for those of us with wordpress. 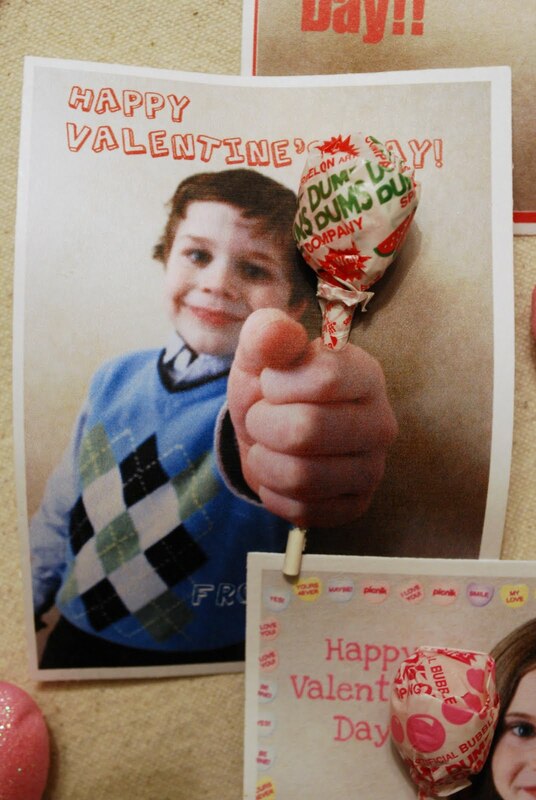 That is the cutest Valentine idea I have ever seen! My daughter already bought hers and filled them out so I will be filing this away for next year for sure! These are AWESOME! I am totally copying you next year! LOVE! That's e great idea! and what a good looking kids you have. We don't having a great Valetine day selebration here in Holland, maybe only a card for your lover. It is a nice idea for tractation on school for my boys birtday also. Have a nice Valetines day. those ARE adorable! My son just informed me this morning he needs 25!!! I think I'll be filing this idea away for next year! Wow, that's SO, SO adorable! Okay....and after scrapping 56 cupcake boxes...I find this clever thing!!!!! where were you a few days ago????? PS - I linked to your blog on my latest blog post. I had to come over and take a look. Hilarious. I like yours better with the smaller lollipops. I love that we both made these. Those Valentine's are HILARIOUS!!! What an awesome idea!! Made these today - found your post from Pinterest. Thank you so much for sharing the How To!